8-man, 16-man, normal mode, hard mode, nightmare mode. There’s a ton of different options to keep us occupied. 8-mans are (logically) the most accessible. Smaller group sizes are easier to put together on a whim. I haven’t set foot into a 16 yet but I think that was always the goal for me, the larger size. A vicious rumor is going around that I can’t verify: that 16-regulars are actually tuned harder than 8-hards. Whether or not this is true, it makes us reluctant to pug and my guild is growing. We’re a bit bigger than an 8 but definitely not big enough to be 16. Growing can be difficult. I’ve cleared EV 8-Regular (that’s a lot of information, isn’t it, just to say I completed one Operation?) twice now. I don’t want to call it “easy” because that isn’t the right word. It’s accessible. It’s puggable. It’s doable without vent or mumble. And it should be. As a first hurdle to large-group play, I think it’s tuned well. Fights are involved but not pinch-point twitch-reflex OMG SPAM SPAM SPAM *tank death. * For those that just want to spend a few hours every week playing, regular mode raids are going to be fast and fun. That said, we toggled to Hard mode and got our butts handed to us over and over on just the trash. We got two pulls on the boss and survived… to the enrage timer. We only got the boss down to 35% health. I look forward to banging our heads on that while we gear people up for it. Another big thing my guild needs to get set up is attendance and roster-stuff. Since regular ops assign loot via computer we haven’t implemented an EP/GP like system though we would like to. In the spirit of full disclosure, I love EP/GP systems because they reward recent activity and, um, I’m a huge nerd with 100% raid attendance. But one thing I wonder about will be the popularity of alts. Once we get into hardmodes I see it being less of a potential problem but last night our ops leader rolled randomly to see who sat and one person’s “main” lost out to an “alt” (because their main was a healer and we were already full there). It worked out in the end; another person dropped out to do some RL stuff, but I’m curious how other guilds are handling things like this. Until we get dual-spec (and even once we do, to a point) it’s easier to bring an alt to stay flexible than it is to change the role of your main. Especially with the prevalance of tier gear. If you want to optimize, you’ll be carrying around two sets of tier gear. It’s a lot to ask of, say, tanks, for some fights are one-tankable and others aren’t. These aren’t new complications, though. MMO-players have been wrestling with roles, gear, and whatnot for years. TOR may end up working out socially like top-end raiding guilds in WoW. Or it might not. We’ll have to see how it shakes out. Have you jumped into Ops yet? What kind of raiding have you done/do you want to do? duos and parties: a-pealing or appalling? It was only a matter of (apparently short) time before I ended up waving my opinions on couples/friends playing together in TOR. Nearly a year ago I wrote a post about leveling together in WoW: Cataclysm (and how I was disappointed. “Seamless” Phasing is absolutely the bane of dual-playing). The long and short of it: Luxin’terior and I play together. A whole bunch. Which is great, because an MMORPG should be easy to play together, right? Class stories are set up so that a friend can help you. They see your cut scenes, they can terrorize your bad guys. This is so flipping sweet. Being able to participate in conversations together, get social points, and join in holocalls when one player is too far away to be there and still see what’s going on and get the mission. Oh, and it keeps conversations interesting because you get to hear other voices and see what other people choose to say. You get to see the light side option (while still getting your dark side points) once in a while. This is great. Little-to-obvious phasing means it’s easy to join in wherever we’re at. My big beef with Cataclysm was that one player of Team Tank & Heal would disappear after taking a quest. In Star Wars, the phased area are instanced off in caves, rooms, etc. While passing through the green film is more game-like, the more immersive “seamless” phasing is not friendly to group play. Not to mention, seamless can get very buggy with gathering nodes and enemies. Mission areas have a decent level spread so even if we’re a couple of levels apart we can still play. And all those heroic quests? Yum. Those are the times that make me so glad I am a full-time healer. Flashpoints are accessible and fun. It’s been easy to get into them, find players to go, and do them. I fell in love with the first flashpoint we ever did (Black Talon): You mean we’re hijacking this ship? That is so cool! Different classes are still set up to get speed boosts and travel helps at similar levels, so with a few exceptions (14 to 15 and 24 to 25) we’re able to stay together without one having to wait on the other. This is pretty minor, but it’s kind of annoying to get a class-specific speed boost and never get to enjoy the benefit because your friend doesn’t get anything like it for another few levels. Or ever. There’s enough non-questing content to keep one half of Team Tank & Heal busy should he or she get an afternoon off. Luxin’terior enjoys space battles. I’m obsessed with crafting and lately, convincing Andronikos that he should love me. Did he really just imply he wanted kids? I don’t have any statistical proof that being in a group gives you higher chances of more and better loot… but… In the 10 or so (post 30) levels I have done by myself I have not once seen a blue or purple drop. Contrast that to when I’m doing missions in a group, we’ve seen several purples and a solid handful of blues. Our companions have some really nice gear because we’ve gotten BOEs that they can use. You do, for sure, get more XP/hr doing missions with a buddy. For one, you can kill more, pull faster, spend less time recovering, etc; but you also get extra xp for being in the group when you complete missions. I love smashing enemy supplies, tossing heals while Lux pulls everything in sight. Mission completed in record time! One player in the group is doomed to the slowest computer and if there’s one thing I really don’t like about TOR, it’s that it is not friendly to average computers. For now, I’m cursed to be the one everyone is waiting on. And playing with another person in the same room shows clearly just how long a gaming computer waits for an average computer. Moreover, participating in the same conversation in the same room is a bane for the sound. Even if we had similar computer builds, we’d be having the same conversation coming out of two sets of speakers at a second or so delay. As it is now, I mute my computer and turn around to watch the scene from Lux’s computer (because the sounds don’t make sense watching it from mine). I haven’t gotten terribly annoyed with that yet, but some sort of anger-response seems inevitable long term. A small plus is that for flashpoints and repeatable content you can space-bar through things once you’ve seen it. But even the loading time to get to the point where I can space-bar gets obnoxious. And if I haven’t seen it yet my friends will be waiting a long time for me to get through (especially if they’re space-barring because this is old hat for them). There’s definitely a lot of reasons to play with people as you’re leveling up. The advantages outweigh the disadvantages. So in that regard, EA has done a great job. An MMO, in my humble opinion, should make it easy and rewarding to join groups and play with other people, which TOR does. Have you played extensively with a friend or loved one? How did the experience go for you? ten rats – dead, or more dead? 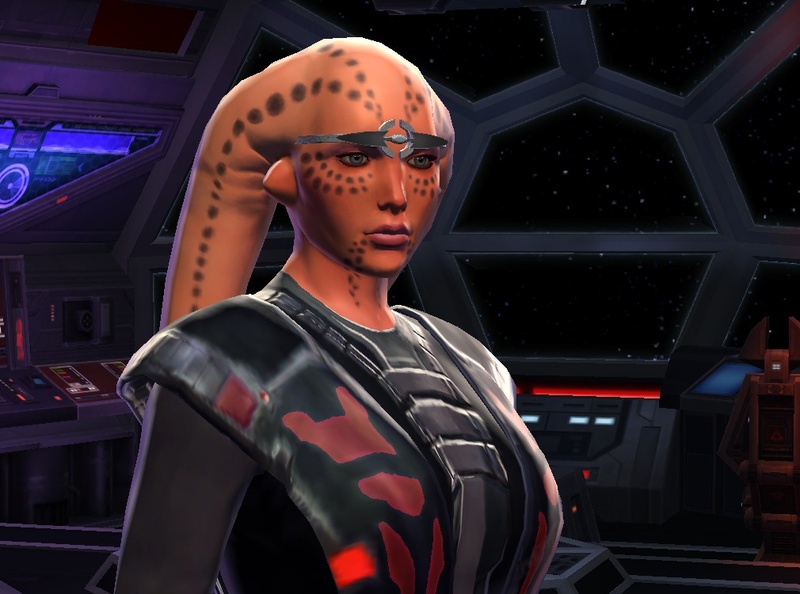 I’ve been thinking about questing in SW:TOR. Oh, oh, I mean doing missions. We don’t do quests in TOR, we do missions. And at the heart of those missions is the dread “kill ten rats” objective. There’s really no escaping these ten rats. The best a game can do is to sugar-coat it, voice-over it, and hope we enjoy ourselves so much that we forget that we’re just killing ten rats over and over again. I believe if someone had a better way to do it, we’d already have it. Most things are redundant in some form; games, jobs, hobbies, most everything we do has some form of ridiculously redundant elements. We like to either downplay the repetition or do things to mask it. Why yes, I did just carry that enormous box across the desert and haul it up three flights of stairs to see you, puny human. Yet you still haven't told me why I should care. Every time I’ve been given a special option to choose how to complete a mission, I’ve enjoyed the mission and remembered it. Deep down it’s silly to enjoy that mission more, it’s still clicking on 6 buttons after killing several packs of mobs. No matter which choice I make those 6 buttons and packs of mobs are non-negotiable if I want to keep doing missions in the area. But give me a choice to make – poison those troops over the course of weeks or make ’em dead via overload here and now? Subvert the mad scientist by bringing the 6 quest items to his assistant to tamper with first or give him the actual results? The conversations with NPCs don’t “matter” for the most part. The cut scene may play out a little different if you’re rude to the puny humans trying to bother you (and I do love how they quiver before me) but it’s still the same quest and maybe a little rep gained or lost from your companion. But that’s another thing. I enjoy playing the mini-game of “What should I say to this dude to make Khem Val love me more?” My character has changed because of this companion. At its heart, this is classic min-maxing and power-leveling. And yet, I get way too much joy out of disrespecting those puny humans to get Khem’s approval. Way too much. When it’s all said and done, people love and value ways to express themselves. And for all the arguments to be made that there’s no real expression in a video game because there’s millions of people playing and only a handful of “expressions”, we still need them. Going back to a real life analogy, it’s the same reason people spend excessive amounts of time personalizing their signatures, their websites, blog headers, gravatars, profile pages. Does any of that actually matter? It does because it matters to the person expressing him or herself, even if a signature or a template will look more-or-less like the other billion on the internet. We enjoy that stuff for some reason. Though… There is one place where I’m consistently pulled out of the game to remember it’s just an RPG. It’s whenever I have to make the choice between light side and dark side. Sometimes, the light side choice is right up my alley. Others, it feels forced, for instance you let some d-bag live (who totally deserves to die) because it’s the “right” thing to do. I do feel like “choosing” light or dark at the beginning of character progression locks you in to stop role playing and always click on the black triangle or white star when it pops up. So has SW:TOR given us enough self-expression and illusion of choice to make us kill those ten rats again? Time will tell, specifically, when we start getting closer to max rank (where it takes more and more quests) and making alts and end up doing the content again. 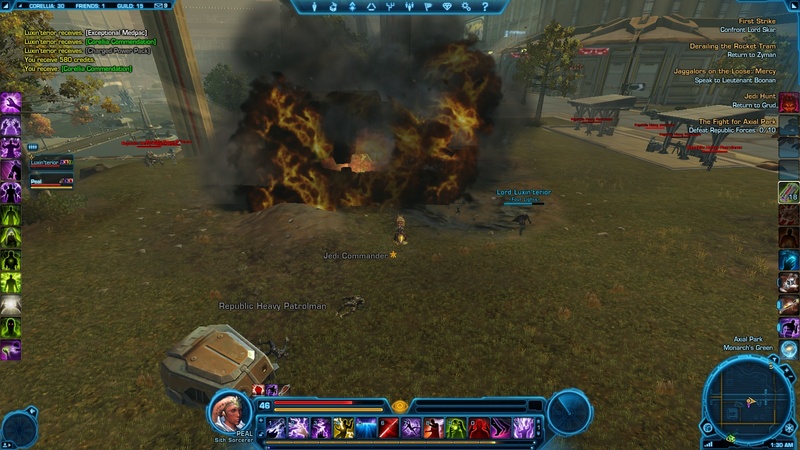 One of the biggest reasons I hesitated getting excited for SWTOR was that I wasn’t ready to be a n00b just yet. That was also my largest complaint with WoW’s Wrath to Cataclysm changeover. Dramatic overhaul of healing systems and grouping mechanics. During Wrath I loved blogging about my learning experiences, posting helpful (to me at least) tips, and ranting. I wasn’t ready for Cataclysm. When I discovered there were only three tiers to Cataclysm and that Mists would potentially be coming out in 2012, I was… so not ready to be a n00b all over again. So, my hesitation to play TOR. I am a huge Star Wars n00b. I don’t know much about the universe. Droids, lightsabers, light side, dark side; okay yeah I know about those things. But that’s pretty much it. I knew to play this game I would (and will) have to learn a whoooole lot of things. Not just a new game. How to interact in that world. The lore. Oh, my god the lore. I should have known it wouldn’t be a problem. Getting started was ridiculously easy (if you ignore queue times). The “what you need to know to jump in” is minimal. And the quests are heavily story-based. 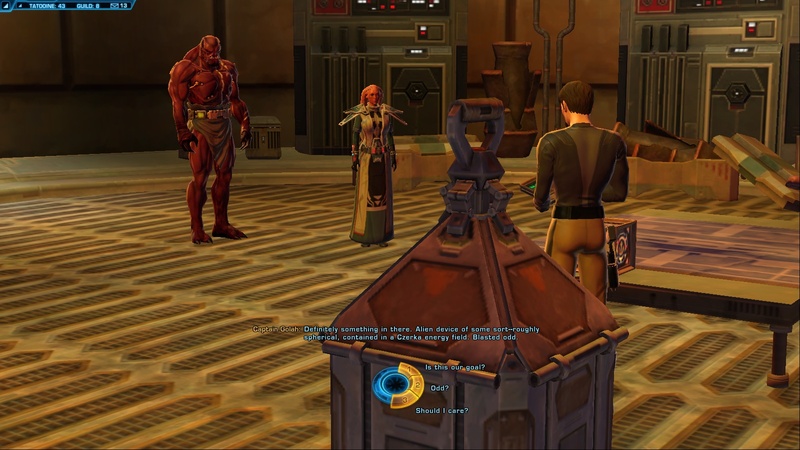 Sure, I knew that SWTOR would be… But as far as user experience it’s ingenious. My journey started the way every story ever has started: with one character. Little by little, we’re fed the lore we need to understand what’s going on in the world. One quest, one conversation, one codex at a time. I’m sure loremasters find enough to keep them occupied. And for n00bs like me, there’s enough grounding to know where to go and see hints of what is to come. The iceberg is there, but I only have to deal with the tip right now. My post title is misleading. I still am very much a n00b and I am okay with that. It’s great to be learning a new game again, to be at the start of something big and shiny and new. All possibilities.